Tinker Kitchen is full of specialized, commercial-grade equipment and hard-to-find ingredients like modernist powders, liquid nitrogen, and more. We’re a community space open to everyone, and we have plenty of space to cook, eat, or hang out—by yourself or with friends—all with a flexible makerspace-style schedule. We're in the Mission District in San Francisco. Hours: 10 a.m.-9 p.m. Monday, Wednesday-Sunday. Closed Tuesday (see also our calendar). We're a little obsessed with kitchen equipment. Tinker Kitchen is a bit like a "kitchen playground" where home cooks can have access to the commercial machines which restaurants and specialty food makers use. Our cook line has multiple ovens, including a German-made "combi oven" with built-in humidity/steam control, commercial deep-fryer, and even a real wok range. 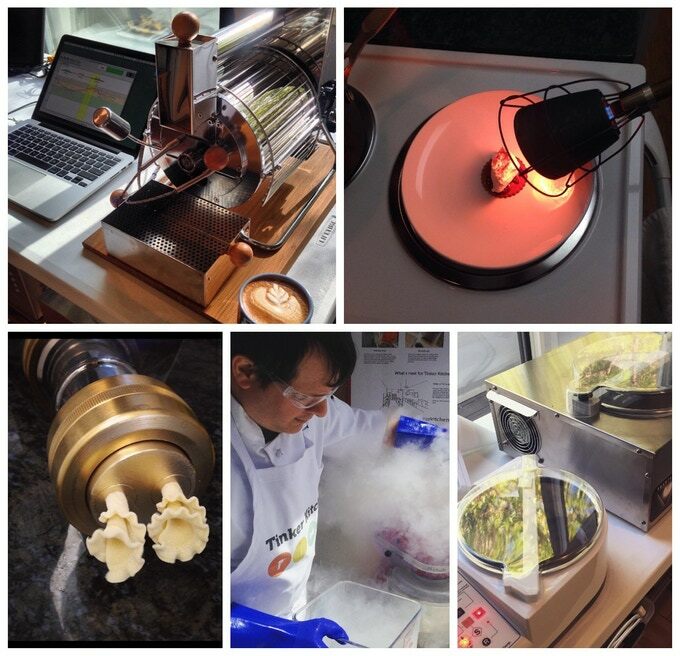 We also have a commercial pasta extruder, at least three ways of making ice cream (batch freezer, Pacojet, and even liquid nitrogen). We have chocolate-making tools—for tempering and making bonbons, as well as for making it bean-to-bar. And coffee—from a drum roaster to a dual-boiler espresso machine. Then there's the lab equipment for modernist cooking—two centrifuges (a refrigerated one and a spinzall), dehydrator, freeze drier, chamber vacuum, and a selection of the powders and chemicals you need to make foams, gels, spherify, and more. We're still working on compiling a full list, but here are the highlights! Combi oven 1 RATIONAL Combi ovens are amazing. They can inject steam and regulate humidity while cooking. Convection oven 2 Baker's Pride Great commercial ovens that fit full sheet pans. We have a stack of 2. Range & oven 1 CPG Commercial 6-burner gas range with conventional full size oven underneath. Deep fryer 1 Pitco We'll probably swap out this fryer for a smaller one. It needs too much oil! Wok range 1 CPG Having a real wok range is amazing. It's 120,000 BTU! Super powerful. Chocolate temperer 2 Chocovision Tempering makes chocolate shiny and snappy. Our 2 temperers make it super easy to do. Wet grinder 1 Premier Used to grind semi-liquid things. Notably, you can use them to make chocolate bean-to-bar. Coffee roaster 2 Freshroast/Quest We have an air roasters (fast and good for darker roasts), and a drum roaster (slower, more precise). Super fun to use. Freeze dryer 1 HarvestRight Make fruit powders, camping meals, and some crazy experiments. But be patient, it's slow. Pasta extruder 1 Bottene Our commercial extruder is a beaut. You'll love the shapes and versatility. Flour mill 1 Mockmill Make your own flours from grain! Pressure cooker 2 Kuhn Rikon/Instant Pot Yes, we even have an instant pot. Blender 1 Vitamix Blend all the things. Mixer 1 Kitchen-aid Classic mixer with attachments. Food processor 2 Robot coupe/Cuisinart I bet you haven't tried a commercial robot coupe food processor before. Fondue pot 1 Cuisinart You really don't need to own one. Dehydrator 1 Excalibur Make your own dried fruit, jerky, and more. Ice grinder 1 n/a Have a sno-cone party. Make SE Asian "ice kachang." Ice cream maker 2 Lello/Paco Jet We have various ice cream machines, including a batch freezer and a paco jet. Panini press 1 Waring A commercial panini press, for extra crispy cheesy goodness. Immersion circulator 5? Misc We have so many sous vide machines, we lost count. Hi, I’m Dan Mills, founder of Tinker Kitchen. Food and cooking have always been a hobby for me, and I’ve always had a love for kitchen equipment and the science of food. From my childhood in Venezuela through my career in the tech industry I’ve slowly expanded my arsenal of tastes, techniques and equipment, always tinkering with something new. In 2015 I started Tinker Kitchen to build an awesome maker space for food where I can share this passion with others. The seed for this concept dates back to my college days, where I had the good fortune to take a very special biology course. Makerspaces weren’t really a thing back then, but that’s exactly what this was: a sculptor and a bio prof had a lab in the basement to explain real-world structures and processes by building physical models. We studied biological organisms, did research, and built models to explain them. I discovered that this learning style is not only great fun, but immensely effective: I can still remember the things I learned back then, even though it’s been almost two decades. That is how I approach cooking as well. I am not only interested in the end product, but in learning the underlying principles. And there is no better way to learn than by having hands-on fun in a highly creative makerspace, with all the tools you could ever dream of, and a community to lend a hand.